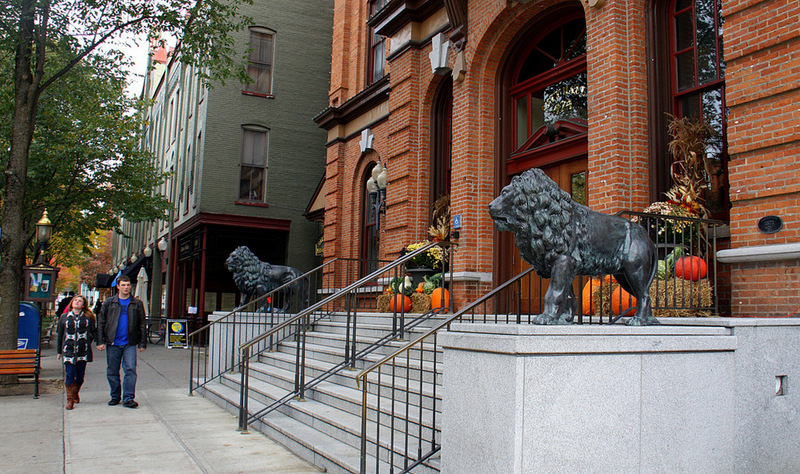 Historic Saratoga Springs, in upstate New York, is a fun place to visit any time of year. 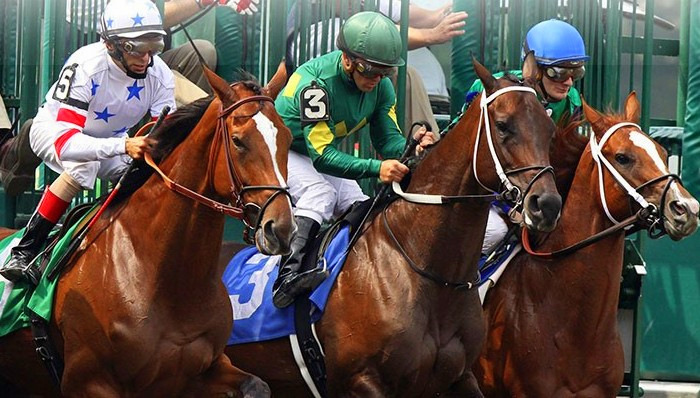 However, there’s a special excitement in the air with the approach of another annual opening day at the historic Saratoga Race Course – the oldest thoroughbred racetrack in America. That’s Saratoga’s slogan. The earliest recorded history goes back to the mid-1700s when the area’s Native Americans were said to be using the healing powers of the naturally carbonated mineral springs that dot the area. The springs became even more famous when General George Washington drank from the High Rock Spring in Saratoga in 1783. The naturally carbonated springs soon made Saratoga a popular venue in which to be seen. Visits from the likes of JP Morgan, Cornelius Vanderbilt and Diamond Jim Brady, made Saratoga famous. Important people from across the globe came to socialize and soak in the bathhouses featuring the healing effervescent mineral waters. However, it soon became evident that horse racing was destined to play an equally important role in the city’s future. As untimely as it seems, just one month after the famous Battle of Gettysburg in 1863, the Saratoga Race Course for Thoroughbred racing was opened, and became the first sports venue in America. 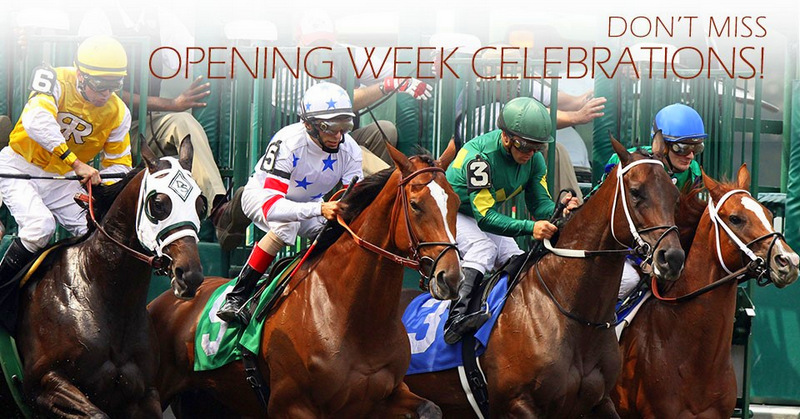 This year, the world-renowned Saratoga races, will begin on Friday, July 24, 2015 and conclude on Labor Day, Monday, September 7, with racing conducted six days a week, Wednesday through Monday. Sports Illustrated calls the annual Saratoga Race Course summer meet, one of the top ten must see sports events in America. The track is also considered by many to be the most beautiful racetrack in the United States. When it comes to lodging, the choices are many in the Springs. 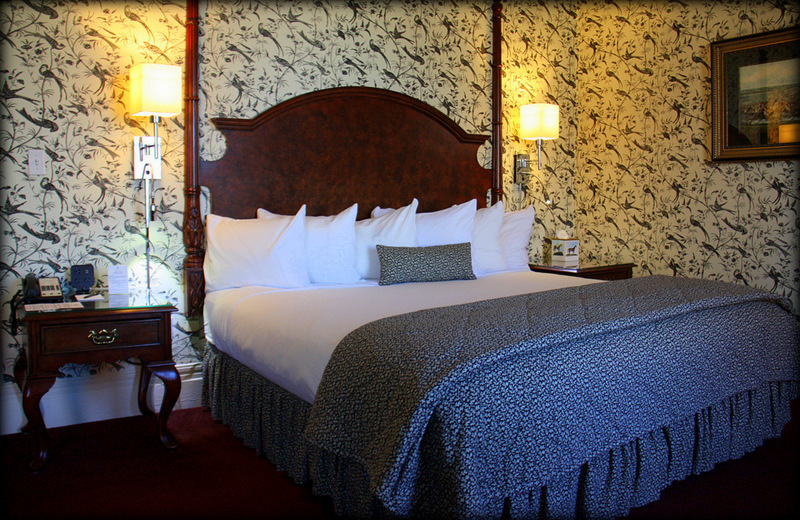 On a recommendation, we stayed at the historic Saratoga Arms – a brilliant choice. 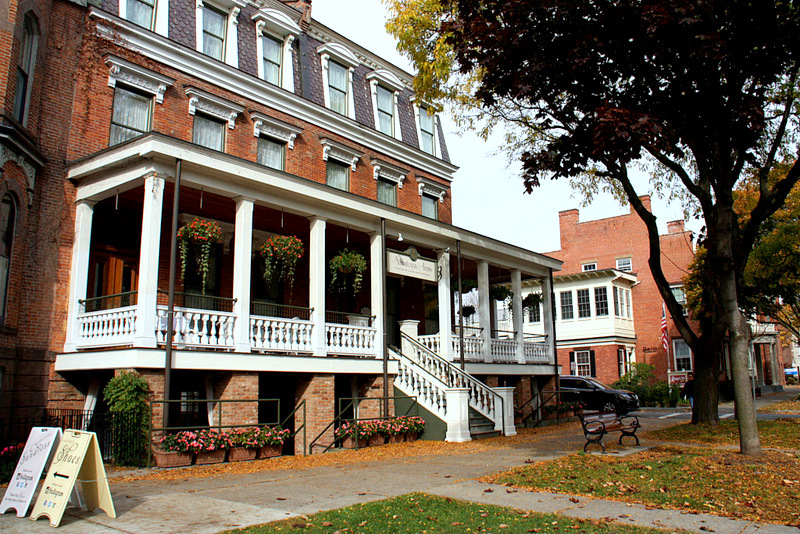 Operated as a luxury concierge hotel by the Smith family since 1997, the historic (circa 1870) brick building on downtown Broadway in Saratoga Springs, had been a rooming house during the 1950s to the 1990s when it hit its proverbial bottom. There were pigeons living in the third-floor rooms. We love to see such old structures repurposed, refreshed, and preserved. The Smith’s restored this old building with loving care and a flair for turn of the century ambiance. 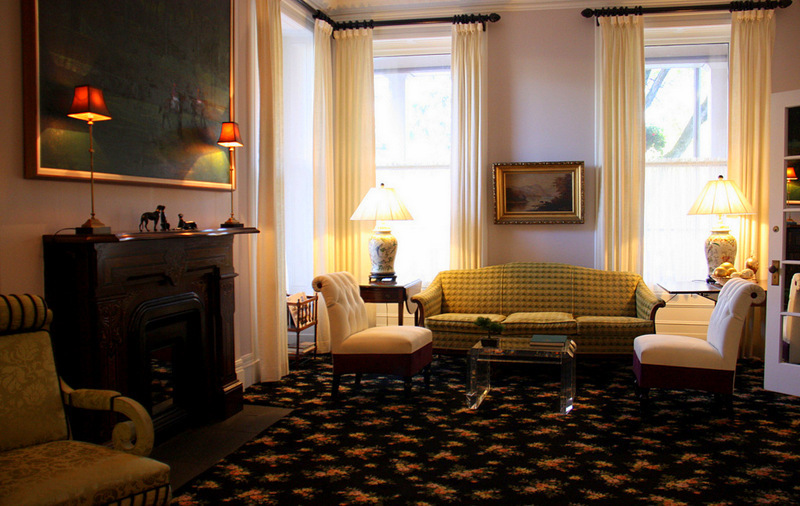 It now has every modern comfort, but retains its yesteryear charm. 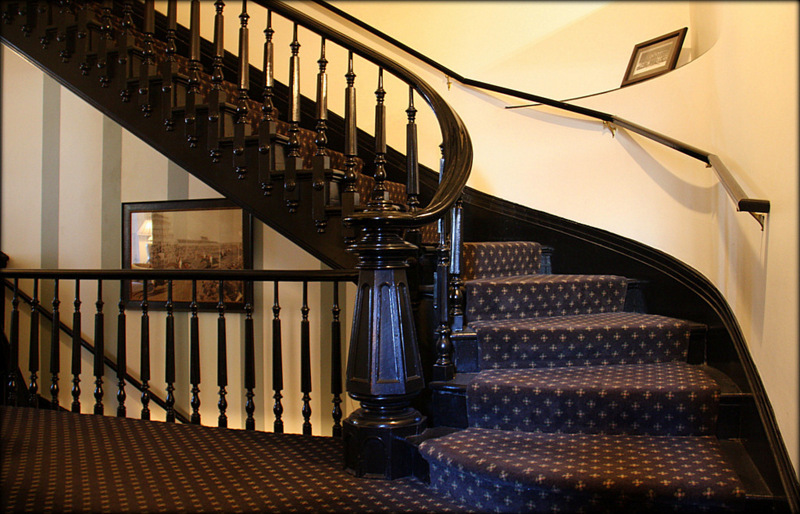 In addition to the elevators, there’s a beautiful old staircase that leads to the upper floors (see pictures). As we climbed the steps, we reflected on the many thousands of people who had preceded us in climbing these same stairs over the past 145 years – we wondered about their circumstances and lives – all so different from our own. The restoration was obviously calibrated to gain a sense of sophistication with informality. It was well done. Urbanity now dominates and permeates throughout. Hotel guests have a choice of 31 sleeping rooms that will suit the most discerning of tastes. 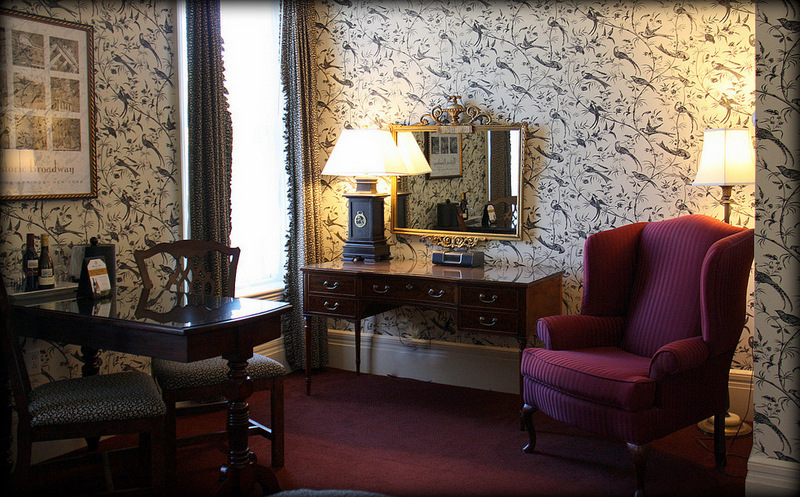 The entire hotel is lavishly decorated with beautiful antique furnishings and just-right décor. 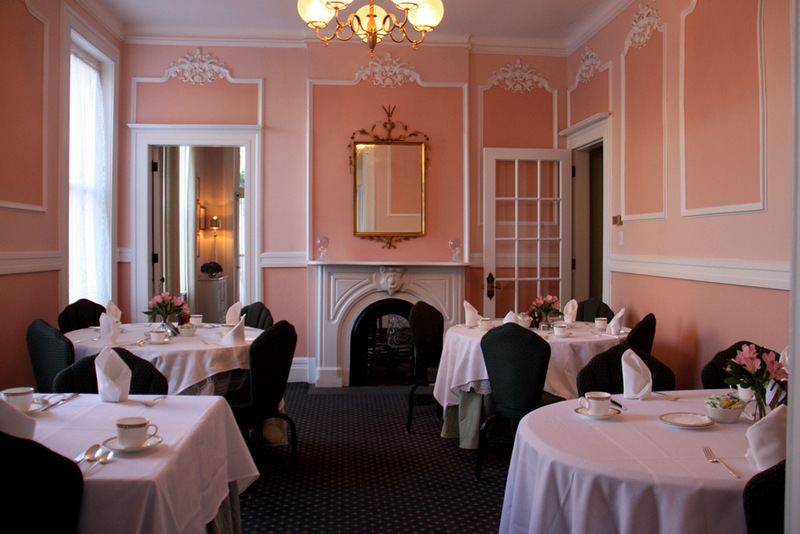 We had breakfast in one of the hotel’s elegant dining rooms complete with white tablecloths, fine china, and fresh cut flowers. Very cheerful. 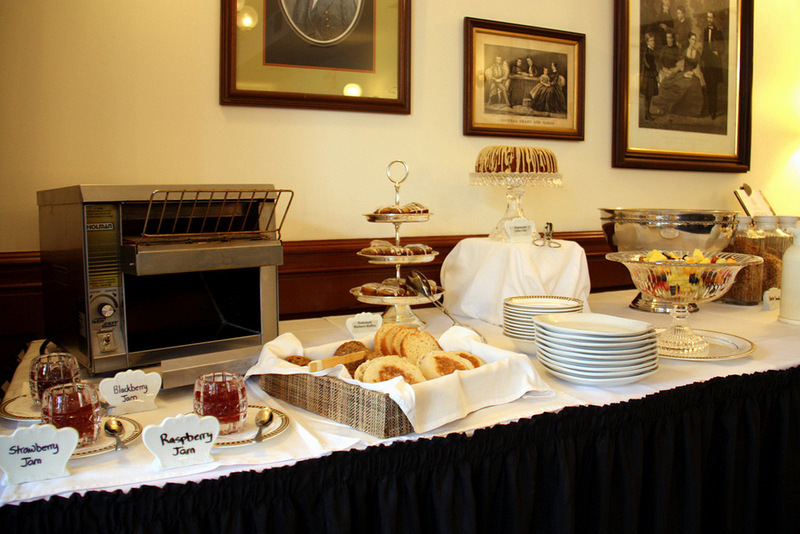 The buffet breakfast is an occasion full of local farm fresh goodies like honey and homemade muffins and jams, delicious cereals, assorted berries, bagels, yogurt, and freshly squeezed orange juice. The coffee is also extraordinarily robust and flavorful. 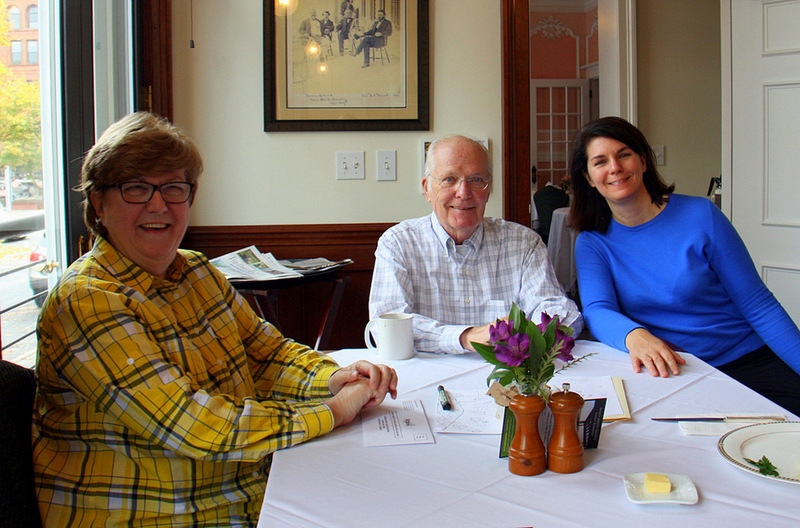 Our main breakfast dish consisted of locally smoked Canadian bacon, and a mushroom and gruyere cheese scramble – accompanied by home style potatoes. 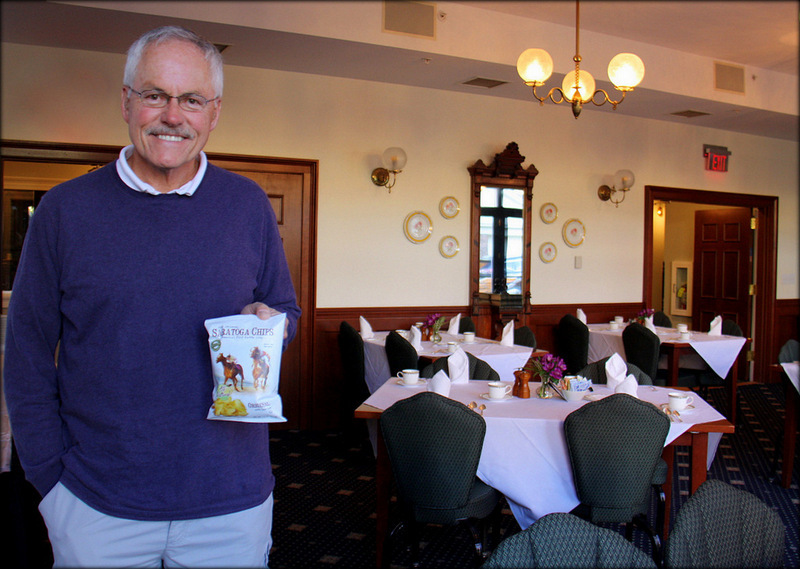 We had never tried the gruyere cheese and egg mix before – delicious idea! Care for an afternoon snack? 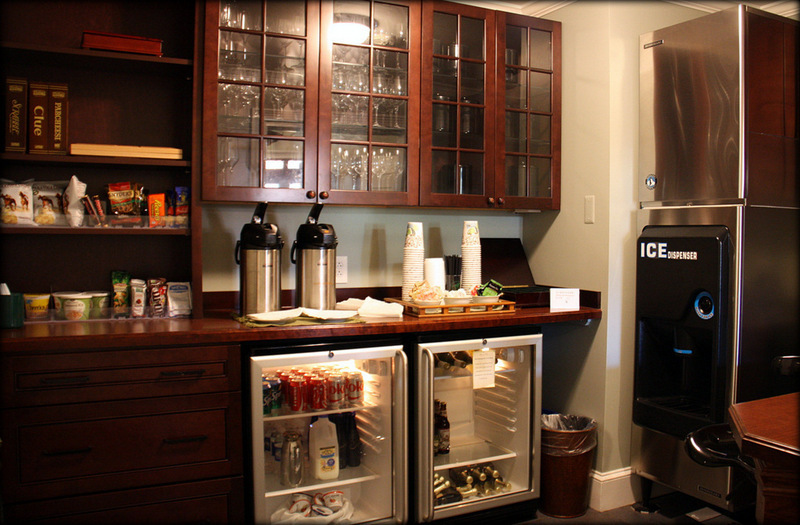 There is an abundance of treats and beverages in the guest services pantry. 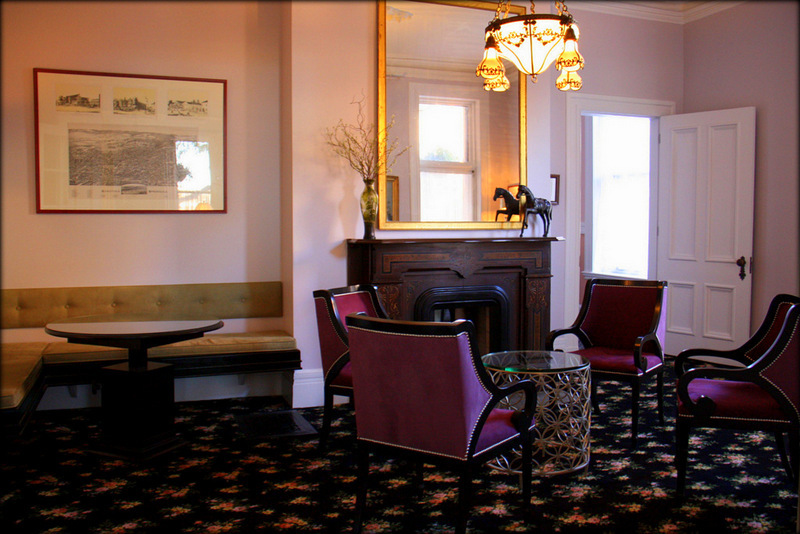 The Saratoga Arms is a lodging we wholeheartedly recommend, and we are in good company, because it is also TripAdvisor’s #1 current choice hotel in Saratoga Springs. 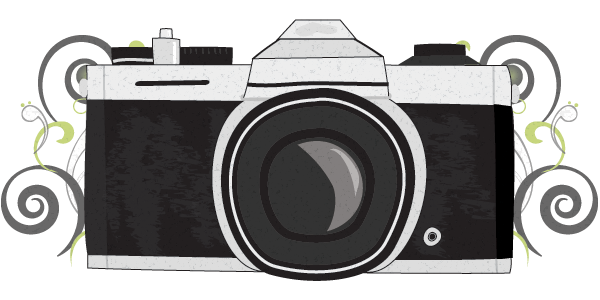 Planning a trip? Make your reservations now to avoid disappointment. 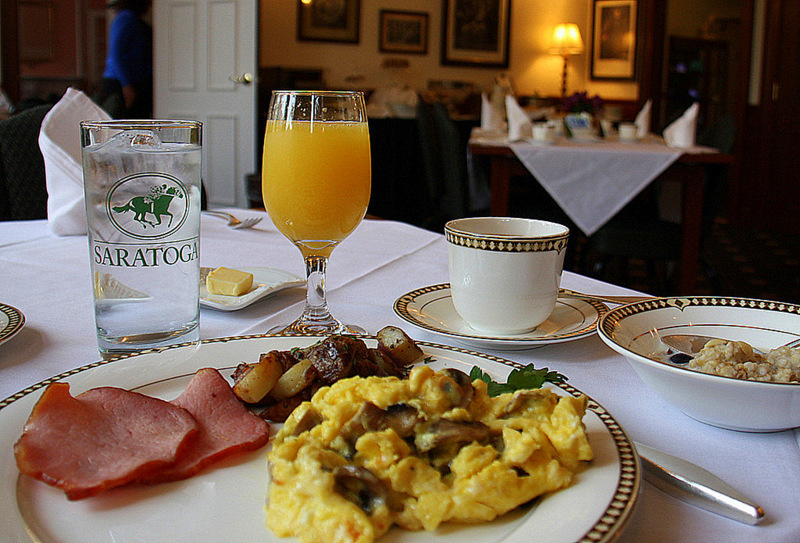 Saratoga Springs is an easy 45-minute drive from Albany, and less than four-hours from New York City, or Boston. It is also five-hours from Niagara Falls. The closest major airport is in Albany, New York. Today, there are 18 mineral springs throughout Saratoga Springs for free public tasting, and two places to enjoy a mineral bath, the Roosevelt Baths and Spa, and the Crystal Spa. 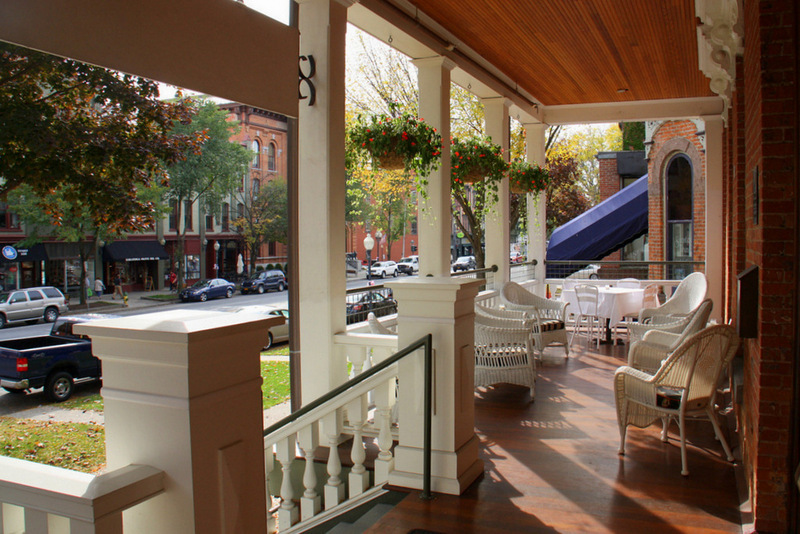 In 2014 Yahoo listed Broadway in downtown Saratoga Springs (the location of the Saratoga Arms) as one of best main streets in America for its architecture, restaurants, shops, and people watching. There’s more to enjoy in Saratoga Springs than water and racing. Look *here* for a list of other activities in this happening area. Photos Copyright © 2015 Judy Bayliff – unauthorized use strictly prohibited. Sports photos courtesy of Saratoga Arms. « A Nostalgic and Romantic Spa Resort in the Pocono Mountains: Yes!